We specialize in the design and manufacture of stainless steel mixing tanks for the pharmaceutical and biotech, food and beverages and FMCG industries. We understand that the product quality of these industries is affected by even the minutest contaminants thus our vessels are designed with full drainability and easy washout capability. Our tanks and vessels are designed to the principle of the ASME BPE standards. We follow the highest standard factory acceptance testing, including material identification, Ra testing, Riboflavin test, Spray ball testing and Hydro testing. We work closely with customers to build customized stainless steel tanks and vessels according to their specifications and performance requirements. 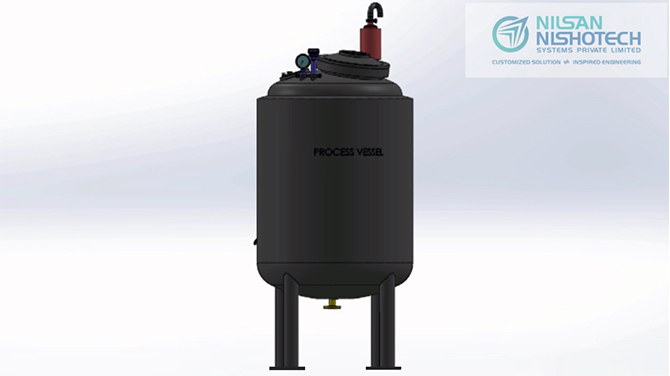 Tanks and vessels designed to the principles of the ASME BPE standards. Full documentation packages for the entire project. Our procedure requires material certification for the source of every component and piece of material that goes into a biopharma tank or vessel. We fabricate to the principles of ASME BPE for exacting form and fit. We have the capabilities to conduct a factory acceptance test on each vessel before dispatching. This includes a polish test using Ra mapping for surface roughness, Riboflavin test using spray coverage of every square millimeter of the interior vessel to confirm complete coverage and a drainage test to ensure full drainability. We understand the requirement of extensive documentation in the pharmaceutical and Biotech industries and we take them very seriously. We include full documentation packages for the entire project including the design along with design calculations, material certification, fabrication steps, all weld procedures, inspection and the final factory acceptance test.